This elephant was struggling to keep its trunk above water when he was found by local Navy officers. The elephant, which conservationists say was most likely washed out to sea while trying to cross the Kokkilai lagoon, was spotted by the Sri Lanka’s navy five miles out at sea. After a harrowing 12-hour rescue, the elephant was released back into the jungles on Tuesday evening. did it really live? 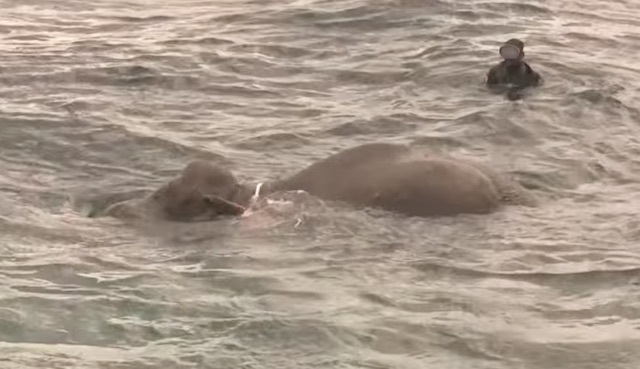 I dont see how they got it back to shore alive , how long can an elephant stay afloat for? I see footage of a drowning elephant but nothing to suggest that it survived…..